Self-adhesive light trap black flock sheet (velour, velvet). Size 10x10cm. Accessories / ARAX Optical Photo Sticky Flocking Sheet. ARAX Optical Photo Sticky Flocking Sheet. 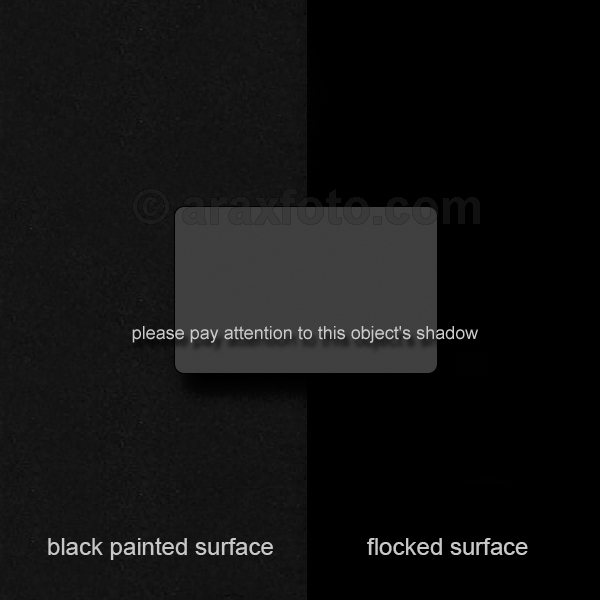 Self-adhesive light trap deep black flock sheet (velour, velvet). Size 10x10cm. Price: $8. Free shipping worldwide! Even the best flat black paint reflects about 3-7% of the light that strikes it, and more when viewed at high angles of incidence. Image contrast suffers when stray light reaches the focal plane. This deep black, non reflective self adhesive flock material is best solution for reducing reflections inside telescopes, cameras, adapters, lenses thereby increasing image contrast. You can use it to make any light trap surface. Black acrylic flocking is adhered to a non-woven fabric, and has a peel-and-stick backing. The non-woven fabric is more flexible and sturdier than kraft paper backed material, making it easier to cover surface irregularities. The acrylic flocking 'fuzz' won't shed and won't absorb moisture, and the pressure sensitive adhesive is durable. The price is for 10X10cm (1 square decimetre, dm²). It is a minimal piece to buy. If you need bigger - just buy several of them x2, x3, x4 and we�ll send the bigger piece. For example, if you need 3 dm² piece, just indicate 3 on the order quantity and we'll send one piece with 3 square decimetre area. We have 2 type of flock sheet. You can choose it during payment.